Around 600 aspirants for the post of Police Constable and Sub-Inspector, who are undergoing a coaching programme offered by the battalion, 200 police personnel and staffers of the battalion participated in the plantation drive. Collector RV Karnan and Ramagundam Commissioner of Police Vikram Jeet Duggal taking part in 'Haritha Haram' programme on Saturday. 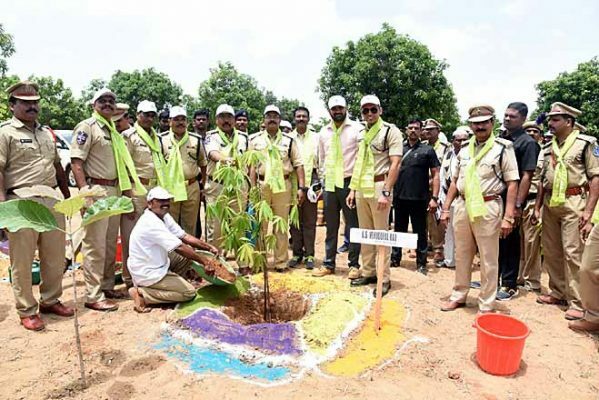 Mancherial: As part of the ongoing Haritha Haram, Collector RV Karnan and Ramagundam Commissioner of Police Vikram Jeet Duggal planted saplings on the premises of Telangana State Special Police’s (TSSP) 13th Battalion at Gudipet village, in Hajipur mandal, on Saturday. They were accompanied by Mancherial DCP MS Venugopal Rao. As many as 5,000 saplings of various species were planted on Saturday. The IAS officer and Commissioner stressed the need to protect saplings and everyone’s participation in raising green cover of newly formed State. They said that the massive plantation drive was aimed to grow 230 crore trees across Telangana over a span of five years. They appreciated authorities of the battalion and Commandant GVS Murthy for coming forward to join the cause. Mancherial Deputy Commissioner of Police MS Venugopal Rao, GVS Murthy, District Forest Officer G Ramalingam, Assistant Commissioners of Police Md Gouse Baba, Balu Jadav, Seetharamulu, Assistant Commandant Jayaprakash Narayana and Reserve Inspectors Satheesh Kumar, Lenin, RP Singh and many others were present. The battalion had planted 15,000 and 20,000 saplings in second and third editions of THH. Over 80 per cent of saplings have survived as officials have been paying special attention to them. Several personnel are tasked to water and safeguard the saplings. Government whip Nallala Odelu and Mancherial MLA N Diwakar Rao also took part in the green drive.